Freedom – TLC/MTM from Prosper Digital on Vimeo. Earn More With Dispatch Payments. Earning extra cash has never been easier! For every trip you complete, you’ll earn a dispatch payment. You’ll receive payments the same way you get paid by your TSP provider for other credit card trips. It’s simple to accept a trip! All accessible vehicles have easy-to-use DIM devices, with a touchscreen system. Accepting trips and getting to your next pick-up is now easier than ever. Take Trips From Anywhere & Serve More Passengers. 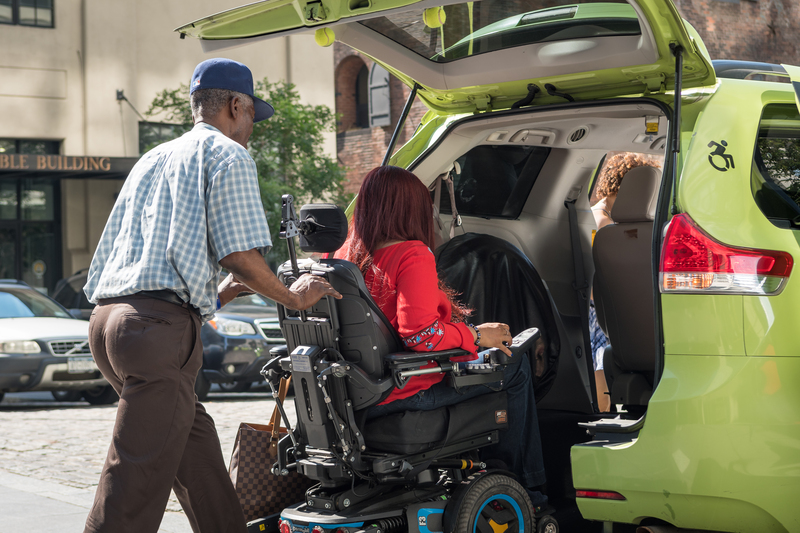 With citywide coverage, Accessible Dispatch offers yellow and green drivers of accessible vehicles the opportunity to provide accessible trips in all five boroughs—giving you access to more passengers. Make NYC More Accessible For All. Transportation is an invaluable resource for individuals with disabilities. Contribute to the public good by making New York City more accessible for everyone. Take More Trips. Earn More Cash. When you take Accessible Dispatch trips, you’ll make more per trip with dispatch payments. Take a look at the charts below! Accessible Dispatch launched in September 2012 as a 24/7 accessibility program, with the goal of connecting New Yorkers who use wheelchairs and other mobility aids to accessible taxis at no extra cost. Now, the Citywide Accessible Dispatch Program offers citywide accessible services in yellow and green wheelchair accessible vehicles. With this expanded coverage, both yellow and green drivers are key partners in delivering citywide accessible service. Drivers receive trips from dispatchers during their shift. Trips are dispatched through the vehicle’s DIM based on your GPS location and availability. As long as you are on duty and logged into your DIM, you remain in communication with our dispatchers and are eligible to take Accessible Dispatch trips. When you are available and selected by the dispatcher, a trip notification will appear on your DIM screen. You must accept the trip. Once you accept the trip, you cannot pick up a street hail or other pre-arranged trip. No enrollment necessary! All drivers operating yellow or green accessible vehicles are eligible to take Accessible Dispatch trips. Remember, to operate a wheelchair accessible vehicle, you must have completed Wheelchair Passenger Assistance Training through an authorized school. VeriFone Drivers: If you’re a VeriFone driver, you can check your balance directly on your DIM screen when you are not active on a trip. The sum will appear at the top left. CMT Drivers: If you’re a CMT driver, you can check the payment by logging into CMT’s portal, Fleetnet, which can be accessed on a PC or tablet. Alternatively, drivers can reach out to our customer service team to check dispatch payment balances. If you have any questions or feedback, please let us know by calling us at (646) 942-5957 or emailing accessibledispatch@mtm-inc.net. To file a complaint about Accessible Dispatch with the TLC, please contact 311. Know a driver who wants to learn more about Accessible Dispatch? Share this with them!